Architect Arch Swank's 1951-designed modernist home for painter Frank Bearden and his wife Fran — now the home of Erika and Matt Yeaman. 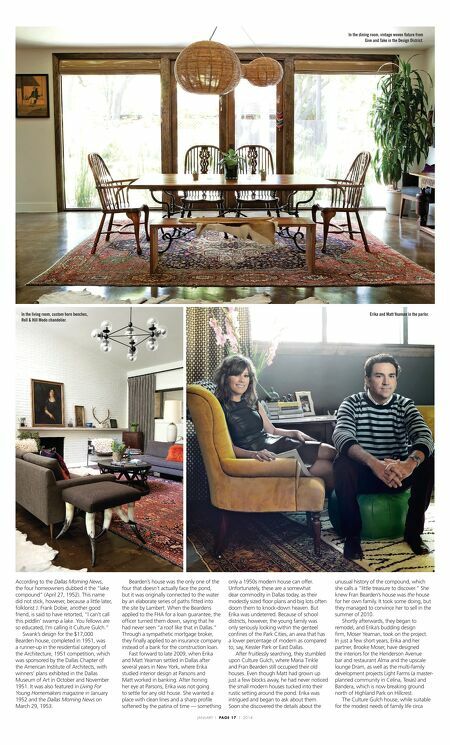 In the Yeamans' living area are vintage Wassily chairs from a North Carolina shop. Large black-and-cream art was found at Round Top Antiques Fair. "I ran across the field to grab it," says Erika. Painting above fireplace is one of many English and American heirloom portraits handed down to the couple. 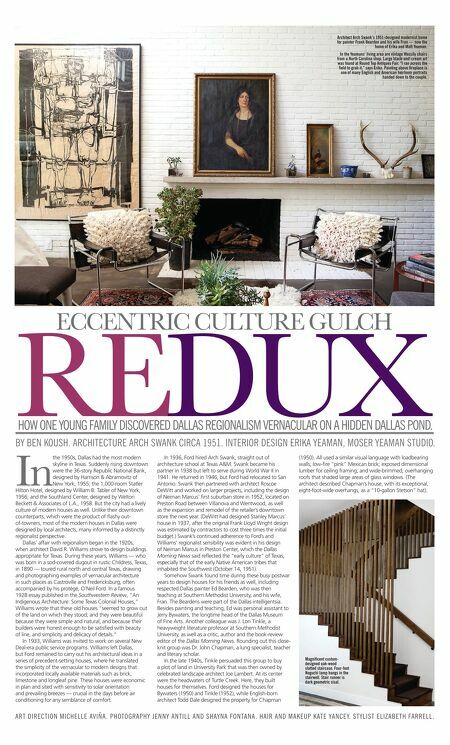 REDUX ECCENTRIC CULTURE GULCH HOW ONE YOUNG FAMILY DISCOVERED DALLAS REGIONALISM VERNACULAR ON A HIDDEN DALLAS POND. BY BEN KOUSH. ARCHITECTURE ARCH SWANK CIRCA 1951. INTERIOR DESIGN ERIKA YEAMAN, MOSER YEAMAN STUDIO. In the 1950s, Dallas had the most modern skyline in Texas. Suddenly rising downtown were the 36-story Republic National Bank, designed by Harrison & Abramovitz of New York, 1955; the 1,000-room Statler Hilton Hotel, designed by William B. Tabler of New York, 1956; and the Southland Center, designed by Welton Beckett & Associates of L.A., 1958. But the city had a lively culture of modern houses as well. Unlike their downtown counterparts, which were the product of flashy outof-towners, most of the modern houses in Dallas were designed by local architects, many informed by a distinctly regionalist perspective. Dallas' affair with regionalism began in the 1920s, when architect David R. Williams strove to design buildings appropriate for Texas. During these years, Williams — who was born in a sod-covered dugout in rustic Childress, Texas, in 1890 — toured rural north and central Texas, drawing and photographing examples of vernacular architecture in such places as Castroville and Fredericksburg, often accompanied by his protégé, O'Neil Ford. In a famous 1928 essay published in the Southwestern Review, "An Indigenous Architecture: Some Texas Colonial Houses," Williams wrote that these old houses "seemed to grow out of the land on which they stood; and they were beautiful because they were simple and natural, and because their builders were honest enough to be satisfied with beauty of line, and simplicity and delicacy of details." In 1933, Williams was invited to work on several New Deal-era public service programs. Williams left Dallas, but Ford remained to carry out his architectural ideas in a series of precedent-setting houses, where he translated the simplicity of the vernacular to modern designs that incorporated locally available materials such as brick, limestone and longleaf pine. These houses were economic in plan and sited with sensitivity to solar orientation and prevailing breezes — crucial in the days before air conditioning for any semblance of comfort. In 1936, Ford hired Arch Swank, straight out of architecture school at Texas A&M. Swank became his partner in 1938 but left to serve during World War II in 1941. He returned in 1946, but Ford had relocated to San Antonio. Swank then partnered with architect Roscoe DeWitt and worked on larger projects, including the design of Neiman Marcus' first suburban store in 1952, located on Preston Road between Villanova and Wentwood, as well as the expansion and remodel of the retailer's downtown store the next year. (DeWitt had designed Stanley Marcus' house in 1937, after the original Frank Lloyd Wright design was estimated by contractors to cost three times the initial budget.) Swank's continued adherence to Ford's and Williams' regionalist sensibility was evident in his design of Neiman Marcus in Preston Center, which the Dallas Morning News said reflected the "early culture" of Texas, especially that of the early Native American tribes that inhabited the Southwest (October 14, 1951). Somehow Swank found time during these busy postwar years to design houses for his friends as well, including respected Dallas painter Ed Bearden, who was then teaching at Southern Methodist University, and his wife, Fran. The Beardens were part of the Dallas intelligentsia. Besides painting and teaching, Ed was personal assistant to Jerry Bywaters, the longtime head of the Dallas Museum of Fine Arts. Another colleague was J. Lon Tinkle, a heavyweight literature professor at Southern Methodist University, as well as a critic, author and the book-review editor of the Dallas Morning News. Rounding out this closeknit group was Dr. John Chapman, a lung specialist, teacher and literary scholar. In the late 1940s, Tinkle persuaded this group to buy a plot of land in University Park that was then owned by celebrated landscape architect Joe Lambert. At its center were the headwaters of Turtle Creek. Here, they built houses for themselves. Ford designed the houses for Bywaters (1950) and Tinkle (1952), while English-born architect Todd Dale designed the property for Chapman (1950). All used a similar visual language with loadbearing walls; low-fire "pink" Mexican brick; exposed dimensional lumber for ceiling framing; and wide-brimmed, overhanging roofs that shaded large areas of glass windows. (The architect described Chapman's house, with its exceptional, eight-foot-wide overhangs, as a "10-gallon Stetson" hat). Magnificent customdesigned oak-wood slatted staircase. Four-foot Noguchi lamp hangs in the stairwell. Stair runner is dark geometric sisal. ART DIRECTION MICHELLE AVIÑA . PHOTOGRAPHY JENNY ANTILL AND SHAYNA FONTANA . HAIR AND MAKEUP KATE YANCEY. STYLIST ELIZABETH FARRELL.